There are things I love about being a mother, and things about it that drive me insane. This is pretty typical, I’d guess, but on the whole I give this whole mothering gig a hearty thumbs up. Insert the cliche of your choice here: It’s the toughest job you’ll ever love! It’s the decision to have your heart walk around outside of your body! Etc. There are things I love about being a writer, and things about it that drive me insane. This is pretty typical, I’d guess, but on the whole I give this whole literary pursuits gig a hearty thumbs up. This is, in fact, the longest I’ve stayed in a single career, and the first time I didn’t hate everyone and everything about it before a year had passed. I’ll just say that once I really started doing this, I wanted to go back in time and smack myself—HARD—for not realizing that this is what I should’ve done all along. Although my family delights in retelling the stories of my bullheaded certainty that I was going to be the next great American actress from a very early age, there’s another story that goes back even further. It’s one that’s best told in snapshots, and pieced together with scraps of bookmarks. It starts with teaching myself to read when I was about three, and constantly negotiating the number of books I was allowed to read before bed. It continues with the confiscation of countless flashlights as I read under the covers past bedtime, and that one fateful time when my mother realized I’d laid a pair of jeans along the bottom of my door to hide the light spilling out because I wanted to read rather than sleep. 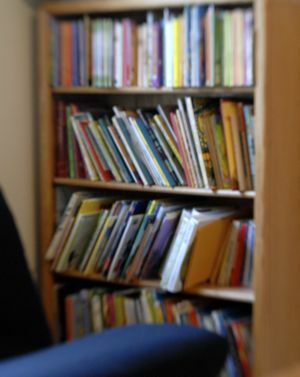 It goes on into the years when I made myself a favorite of each school librarian, as I read through the shelves, methodically, and preferred hanging out inside with a book to being teased on the playground. It covers the time my mother argued at the town library that it was ridiculous that a child’s card only allowed six books at a time, and maybe gets a little bit of decorative foil or something on the day we realized that I’d read every book they had in the Young Adult section. I suppose that day—when I then began borrowing from the adult section—is the last necessary point of interest. The gateway, such as it was, to the continued lifetime of book-devouring, less remarkable though it may be as an adult. And so, naturally, I hoped that my children would share my love of the written word, but I knew it was hardly something one could order up, any more than I could’ve requested Monkey’s dimples or Chickadee’s sense of humor. All I could do was provide ample reading material and keep reading, myself. I needn’t have worried; sometimes it takes a virtual crowbar to pry them away from whatever they’re reading, to get them to come to dinner or get ready for school or HELLO, CROSS THE STREET AND LOOK WHERE YOU’RE GOING, ARE YOU TRYING TO GIVE ME A HEART ATTACK? In this house the children have both a playroom and a reading room, which—for those keeping score at home—does mean that they get a majority of the house to themselves and that they are spoiled rotten. It also means that they have a futon nestled between two overflowing bookcases, and that one or both kids can often be found sprawled on the futon in a state of oblivious bliss, flipping pages and immersed in a different world. Would I love them to pieces even if they hated to read? Of course. But is it all manner of fanfreakingtastic that they do? You betcha. To recap: I love to read, and my kids love to read. That’s lucky. I love to write, and I’m lucky to be able to do so. All of that would be quite enough, really. But then I got even luckier; now I get to read, and my kids read, and we talk about it, and laugh about it, and then I get to write about it. So now I’m realizing that I’m not just lucky, I am living a life I’d never dared to even want, back in the dark days. Because it’s crazy. It’s awesome. I love it, and I’m so very lucky. On all counts. Happy Love Thursday, everyone. Stock your bookshelves… and then cross your fingers. When I grow up I wanna be just like you! Happy Love Thursday, Mir! A reading room! I want a reading room. Do you want to hear about one of the best days of my life? (What? Of course you do!) It was the day I asked Bubba what he was most excited about starting kindergarten and he said “Learning to read.” Sigh. It made me so proud! You??? TOTALLY ROCK!!! OMG, what a cool new gig!!! Congratulations!!! And that photo accompanying your blog is just perfect!!! Who is your photographer??? And I’ll just add that I LOVE observing my duo when they are engrossed in a book. I particularly love watching Curly Girl walk through the house while reading, a skill I still haven’t perfected. But the fact that she can’t stop reading long enough to fetch a cup of water, head upstairs to shower, what have you…I just love that! That’s so great. I was that kid with the flashlight under the covers, and I seriously don’t know what to do with myself if I don’t have a book — I’m sort of like Megan’s Child Two, in that if I’m going somewhere that requires reading material (like jury duty or a long flight) I tend to bring two or even THREE books, just in case I finish one. Sigh…my family just relocated from Orlando to West Palm Beach (for my husband’s job). Until our Orlando house sells, we’re in smaller rented condo. What on earth does this have to do with your post, you might ask. Well…we could only fit the basics from our house in the condo (try going from 3300 square feet to 1800 square feet)…and the first casualty was our library. All of my books are loaded in boxes in a rented POD. Also, I am absolutely prohibited from acquiring new books (although I got myself a Kindle, so I have a little reprieve…the Kindle is cool and handy, but just not the same). We also can’t just borrow willy-nilly from the library. I miss my books. Sell, house, sell (so that we can buy a new one and have a library again). Thanks for the post! That is just awesome. I will be reading it regularly. Is there some way we can comment on the articles on the Scholastic site? And the ant book you reviewed sounds great. We are taking the kids to the New Orleans Insectarium, and that seems like a perfect book to read on the way down there. We are taking the train, so we need plenty to keep them busy! And I would not say that you are lucky. I think your happiness is the obvious result of living a good life. You deserve it. Is this a terrific idea or what????!!!! You, chickie and Monkey! I applaud; I applaud. This might be my favorite post ever. I would tell every parent out there that the absolute best thing you can do for your child is to instill a love/obsession with reading…they will be better learners, better writers, better students, and better people. Read to your children and let them read to you, and start early. This concludes my sermon; the choir may now sing. Okay, I must admit it. I am jealous. I so desperately want my children to love reading and it just isn’t happening. They’d rather play video games, ride their bikes, jump out of trees, and chase the dogs around the yard. Heck, they might even prefer hard labor. Again, insanely jealous because it doesn’t matter what genre I buy, they’re still not impressed. They don’t get lost in those other worlds or make friends with the characters they find. It can be so utterly depressing. Oh ok I suppose I’ll stop harassing my 8-yr-old for being caught at freaking MIDNIGHT, reading a book by nightlight. Can you convince them to do a rss feed for your posts? I would love that. I love this. I’m a reader too, and my 7, no wait, strike that, almost 8 year old daughter definitely is a reader. The 2 year old boy loves books too, so I’m hopeful that he’ll be a reader too. The Kitchen Table Reviews are great. But . . .
No RSS feed? Really? Ack. WHAT a fantastic gig! Congratulations, Mir! AGAIN. You are a pretty amazing businesswoman. Making that whole, “Do what you love” thing seem like it actually works. Very excited to read your kitchen table reviews! I, too, am a voracious reader and worked my way through the entire school library. As a child, my mother was horrified to get a call from the principal’s office, where I had been sent for reading in class. Reading. In. Class. I am a very fast reader…practice makes perfect and all. When assigned reading, I would finish the assignment then whip out my book of the moment and commence reading it. Silently. Even though I knew the required material, I was disrupting class or some other crap. I still don’t get it and my mother tells the story to this day. Usually after some incident that brings the “ONLY Cindy could…” line out. Sigh. I have thus far failed to instill a love of reading in my children. I have tried and tried and tried and they’re not there yet. I say YET because I am going to be optimistic for once in my life and hope they have a lightbulb moment at some point. You’re very very lucky, you know that, right? This is what I wish that some of the disadvantaged kids there or anywhere could see — kids reading because it opens up their imaginations to so much more than cartoons, movies, and game producers can. Those forms of entertainment have their place, but reading will be with them and available to them whether or not the power is on, the cable or internet is available, or if there are any batteries. I suppose that solar powered gameboys are a possibility, but a book…, that is basic. We have a reading room too! Most people call it a loft, but it has a twin bed/couch thing and bookshelves and the kids always are hanging out there reading. I loved reading this post! So beautiful! Daughter number one is in the process of moving from Norfolk to Denver (for her sweetie’s job). She is 34, and this is her first move like this, and is having to GIVE UP SOME OF HER BOOKS!!! She is weeping over the phone to me like she has been asked to make Sophie’s Choice. I know she will survive this, but to anyone who loves books, it can be traumatic when you have to decide what stays and what goes. Oh, and congratulations to you that you have two readers. I think that my parents encouraging me to read what I enjoyed is the greatest give they gave me. We use our great room as a reading room. When the movers asked us where we wanted the tv, I said “stick it in the garage for now”, and they TOTALLY tried to talk me out of it. We did eventually put it in the house, in the “formal” livingroom that no one ever goes in. The only thing allowed in the reading room is books and a few acoustic guitars. The kids all want to be near me (the kitchen, of course), and they’ve all got their “spots” for reading, so it is perfect. We need more bookshelves, though. Heh, heh. Just read the Kitchen Table Review on the Life and Times of the Ant. Why does the Impulsive Buy come to mind? our son took to books like a duck takes to water. our daughter, not quite so much – unless you count manga. a whole new world opens up when you read. i wish every child could discover it. I’m so glad yours have. HEE I taught myself to read at 3, too, although my mother says I had LOTS of help from Sesame Street and my older brother. And I want to say, speaking as a reader, how glad I am that you choose to write—your work is a regular source of pleasure. I caught the Toddler reading by flashlight long after I had tucked her in to sleep a few nights ago. I was too proud to scold her. Mir, I know exactly what you mean. Thank you for puting it into words. Your post really struck a chord. That’s why I am leaving my lurking mode of well over a year to finally actually comment. Reading was my EVERYTHING as a child. Particularly as an only child many times my books are what kept me company. That’s why, when my Buddy was born with Down Syndrome, I felt sad that this was something he and I would never share. Well pa-ha to that. Fast forward 15 years to a kid with Down Syndrome who devours books just as much as I did/do. Who knew?!?! Well heck, I learned to never underestimate my Buddy, that’s for dang sure. Also, I learned to never underestimate the power of a good book. Of course I also had to go out and buy 2 copies of all the Harry Potter books because he and I kept fighting over them. Buddy loves to read. My joy is complete. I’m glad to see there are other kids/parents who get it too. Now I know we’re in good company. I didn’t begin to enjoy reading until about 5 years after I’d finished college. There was so much required reading throughout high school and college that to heck if I was going to read for pleasure, too! But, I’ve found a love of a good “mindless” novel to just relax and take me away from regular responsibilities. My 7 year old is really enjoying reading now, too, so I’m trying to get those bookshelves stocked! I don’t recall if I loved reading like he does when I was seven, but I hope he continues the love as long as possible. This is going to be fun — will you let us know when a new one posts? There was no limit on library cards when I was a child. Only a limit on how many I could stack on my handlebars and still get the two miles to home. I used to read till my mom came in, then pretend to have fallen asleep reading and she’d turn off the light. Some nights that was ten (I’d sneak into the closet and turn on the light to read), some nights two. At school? Book tucked into my open text book. My kids? No reading gene. Dang it. This column looks like it’ll be fun, both for us to read and for you all to write. Has Chickadee and/or you read The Book Thief? It’s “young adult,” though my book club read it last month. I loved it. It’s about a young German girl in Nazi Germany. I am so excited about your new Scholastic blog! I love all your blogs. I, too, read voraciously and want so desparately for my daught to love reading, too. It’s hard for me to not push it on her too hard; I don’t want to push the desire right out of her! What an exciting, wonderful and totally awesome GIG! Both you and the kids will have such great fun,I’m totally seriously jealous! Congratulations, you’re making me wince now about my writing skills! It’s the luck of the draw, I think. Our house is full to the rafters with books. All the librarians know me by name. My kids both learned to read early and easily… and yet neither one has EVER sat down to read a book for fun. EV. ER. They both need constant stimulation from the outside instead of from within, either by playing computer games or by playing with friends or by driving me crazy when neither of those options is available. My mom had a very high-stress job that required a lot of working at home, and I don’t think it would have been possible for her to have achieved what she did, if my sister and I hadn’t been so addicted to reading. I’m happy for you and for every parent whose kids love to read. My life would be SO different if my kids were the same way…. Even total immersion in a reading environment can’t guarantee they’ll love to read. I surrounded both of my daughters in books from the moment they saw the light of day, read to them, they had a reading corner, they saw me reading a lot, but only the older one is a voracious reader. The younger one went through her entire childhood wihtout catching the reading bug. But the other day she actually asked if I had any books she could read, so there’s hope, but I don’t think she’ll ever be an uberbookworm the way my older daughter and I are. First of all, beautiful pic! Should we thank Otto for that?! Secondly, I too love to read, and have a bad habit of leaving a book open face down on my desk (which doubles as our kitchen table) and reading it instead of working. Doh! My son, however, is 7 and HATES to read. Oh he can definitely read and is, in fact, the top reader of his class, but trying to get him to grab a book to read for fun is like trying to pull the Mac and Cheese crackers away from my 4 year old – it ain’t gonna happen. Did you have any tricks that got Monkey from simply reading to ENJOYING it? I had to smile the night we found my reluctant reader reading in bed. He doesn’t need a light because he reads Braille, so we have no idea how long he was pulling this (wonderful) stunt! I still do the reading under the covers with a flashlight when my husband wants to sleep but I want to stay in the room. Its fun to feel like a kid again. I got lucky and got 2 READERS too. And yes, I know that its not just luck – I did and do model reading and so does DH. Many an evening finds all 4 of us sitting around the living room, each with a book. We give the library a good workout. Last time we went in I had to ask the librarian to check in our books right away, so I would have room on my card to get more. We barely made it under our 50 book limit – and most of those belong to my 12 yo son. He is frustrated right now because our library is closed for 2 weeks (getting ready for an expansion project) and he has almost finished all his books. Luckily he can check out books from school – and he rereads books too. There is nothing like going into a used book store, finding the classic section, pulling the first book off the shelf, opening it up and breathing in the essence of it. I think you’re all lucky ducks. I’ve been forbidden from bringing any new books into the apartment due to the fact that my dad is convinced that my room is a fire hazard. I might have taken to stacking books behind where my dresses hang. Chickadee and Monkey are incredibly fortunate to have you to promote reading (as well as to help feed the healthy addiction) and even get to have a room dedicated to it. I was that kid under the covers too! My grandmother still jokes about it at family dinners. When she was visiting, she would come to check on me in the middle of the night and find me still up reading. Good for you that your kids are readers too! Since your reading history is almost exactly like mine, I had to bookmark your review site! Right now we’re in the repetitive reading with our younger child (I’ve read Goodnight Moon so many times, I’m considering hiding it, and I love that book) and the older one is learning to read. Good times. You write stff like this and I freak out just a tiny bit, realizing how similar we are. I wish we had a reading room. If I ever build a house, it’s going to have a library. That’s just non-negotiable. I’m sitting here at my desk in the library where I work, getting all misty-eyed over this post. While I love every word you wrote, I might have to argue that I have the most incredible job in the world. I spend my days working with children who ask me to help them find books that they want to read, can’t wait to read, are dying to read. There is nothing greater than handing a kid a book and watching his face light up like it’s Christmas morning! AND, just tonight when I was home for dinner, my son (who will be 3 next week) furrowed his brow and stared at the stack of newspapers on the end of the table. Then he spelled out S-A-L-E….and said, “that spells sale, mommmy!” Not only did he read a word by himself for the first time, it looks like he’s going to be a bargain hunter, too! I really thought I might burst with pride. I, too, was one of those read-under-the-covers, would-rather-read-indoors-than-go-outside-on-a-gorgeous-summer-day, started-reading-before-kindergarten kinds of kids. I prayed, when we had the boy, that he would be a reader. All signs pointed to “No”, until the past few months, when he started devouring all the books in his (freakishly large thanks to his mom’s wishful thinking) library. Thank god, or i was going to have to try brainwashing. My boyfriend has learned that trips to the bookstore can take three hours if he isn’t with me. He has also learned that I can make five trips to the library in one week because having thirty books checked out from the library is too many at once, so I check out in twos and threes, and finish them in at most, two days. I love reading and my mom loves reading – her bookshelf is stuffed and overflowing. Your post made my heart soar! I’m a children’s librarian and LOVE to see kids like your two come visit me at the library. I’m also way jealous of your reading room! I want one! What a wonderful story! I’m the child of teachers and was always encouraged to read but have never be passionate about it. That said, I do plenty…most non-fiction, historical type stuff, hence the BA & MA in history. Getting sidetracked, I get a guilty pleasure using the word “stuff,” it’s oh so low-brow. Mr. Decker…are you out there? Middle school teacher of mine with a strong desire to permanently remove the word from the dictionary. He made quite an impression. SHUT UP!!! You’re writing for Scholastic??!! You never cease to amaze me and you get prettier every day!! What a great gig for you three! I look forward to reading your book discussions! Love the photo for the column. I so hope my little guy turns out to be a reader! Now that is the sweet life. Reminds me of how I languished in insurance land for so long, then after my 2nd lay-off, in my late 30s, “discovered” working at the library. I felt like a moron; as someone completely obsessed with reading, what the heck took me so long!? I’m doing the SAHM gig now, but if I ever go back to work, I’m gunning for a library position! I have to admit I really do not like to read, however, I have realized now that my son has also inherited this. It is actually odd that I do not enjoy reading because both of my parents love to read, so does my sister. Also, I love to write, which in turn should make me love to read. So you have inspired me. I am going to start reading more, in front of my son. Hopefully, it will encourage him to read. He is a little behind going into the third grade with his reading and I am having a hard time actually getting him to practice. Maybe for the next two weeks we can read together, hopefully that will help. Thanks for the inspiration!! That is awesome. I read to my boys all the time and I hope that they learn a love of reading from me. My kids love reading too and I LOVE it! I’d also love an RSS feed for your Scholastic site. What a great idea! I usually lurk (love your blog!) but this post brought me out of hiding because, well, you are living my dream – the kids, the books, the writing! Good for you! Hubby and I are in the process of adopting and the one thing I am buying with abandon as we wait (not always patiently) for our kids is books. I hope they love them the way I do! Okay, off to find space to create a reading room for the kids we still don’t have! One of my very favorite moments as a mom was the first time I watched my 4-yr-old daughter “read” to her little sister. She’ll recite entire books by heart and Bee will laugh and clap and cheer. I can usually get about 5 minutes of peace out of it, but do you think I ever do anything other than stare adoringly at them? Nope. I’m happy just watching them. Wow… GREAT gig, and GREAT banner photo, too! Congratulations all around on that. And for me,another eason to keep on hearting you so much!